Mana Khemia 2 characters also set to appear. 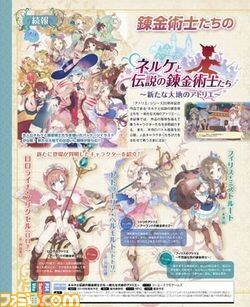 The latest issue of Weekly Famitsu confirms Rorolina (Rorona) Frixell, Totooria (Totori) Helmold, and Firis Mistlud will appear in the upcoming town building RPG Nelke & the Legendary Alchemists: Atelier of a New Land. The magazine also has first information on the game’s battle system. 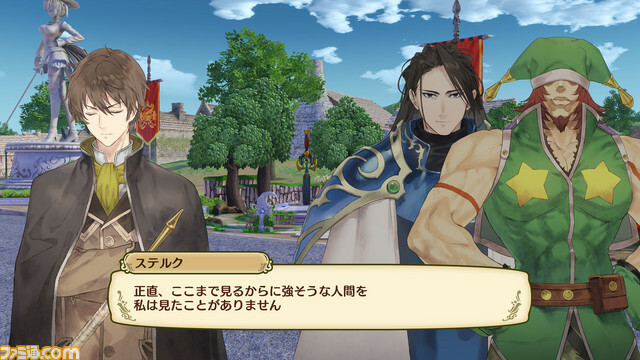 Up to five party members can participate in battle. Players can choose their favorite characters before heading out to explore and collect materials. The action order gauge system that proceeds through active turn-like battles will return. There are even flashy scenes during attacks, and battles can be sped up. Lotus McGregor (voiced by Makoto Naruse) – Nelke’s overseer, he is an elusive old friend. Kunos (voiced by Tsujii Kengo) – The village headman of Vestbalt. If you missed our previous coverage, read more about the gaem here, here, and here. Nelke & the Legendary Alchemists: Atelier of a New Land will launch for PlayStation 4, Switch, and PS Vita in 2018 in Japan.